Piano is one of the most popular instrument that took so many people interest to learned on how to play them. For beginners, it is hard to find the most suitable unit to help them develop their skill since it must be affordable yet still good enough to listen to. 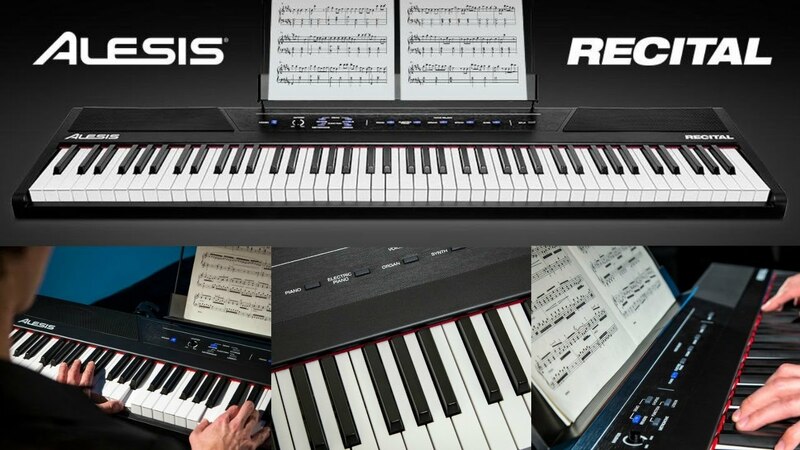 Two popular pianos you can get in the market are Alesis Recital vs Alesis Recital Pro. If they took you attention too, you may want to take a look at our article below. We are sure even though you are a new player, the Alesis name is already familiar to you. The company has been around for quite some time now and continue to release high quality products for both new user and those with more experience. Beside pianos, they are also manufacturing other electronic instruments like drum machines and digital audio interfaces as well as recording equipment. One of their beginner friendly instrument is Recital electric piano that is designed without any confusing programming function and a nice sound you will surely love. Looking at Alesis Recital from the outside, we can clearly see that the unit is made for an entry-level users. It is designed to support new users and perfect for those who want to develop their skills without having to spend hundreds of dollars. What’s standing out from the appearance is probably the design of its control panel because they choose to use LED button here making the piano look even more stylish and futuristic. The body is light and slim, so you can store it easily when not in use. 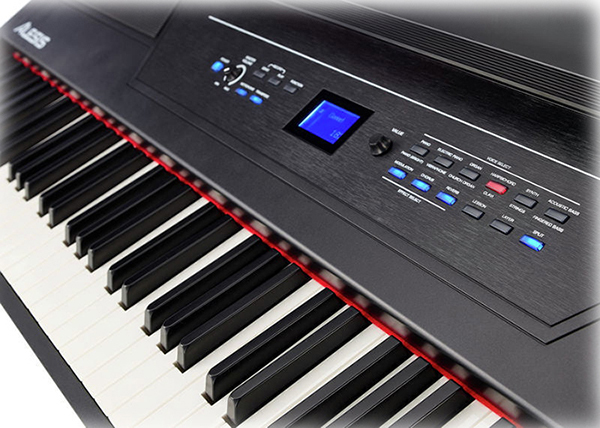 Read our previous article on: Alesis Recital vs Yamaha P45 here. This electric piano is coming in full 88 keys which are semi-weighted with adjustable touch sensitivity function. What’s great about weighted keys are you can train the feel on playing real acoustic piano, but since it is an affordable model, you also shouldn’t hope too much for the price you pay. You can have 5 stunning built-in instruments here like the acoustic piano, electric piano, bass, organ and synth, so you can play a wide range of musical sounds. Alesis Recital will let you take those sounds and customize them to follow your personal taste by combining two of any of them in the layer mode. Many pianos in its range are offering 64 polyphony but this one is coming with a whopping 128-note. It is probably not necessary for beginner but if you plan on keep using or learn to play more complex notes, it can be really helpful. There are also Reverb and Chorus customization capabilities to help you get the sound exactly what it needs to flourish. With two powerful 20-watt built-in speaker, this piano will give you that realistic and powerful sound for better playing experience. 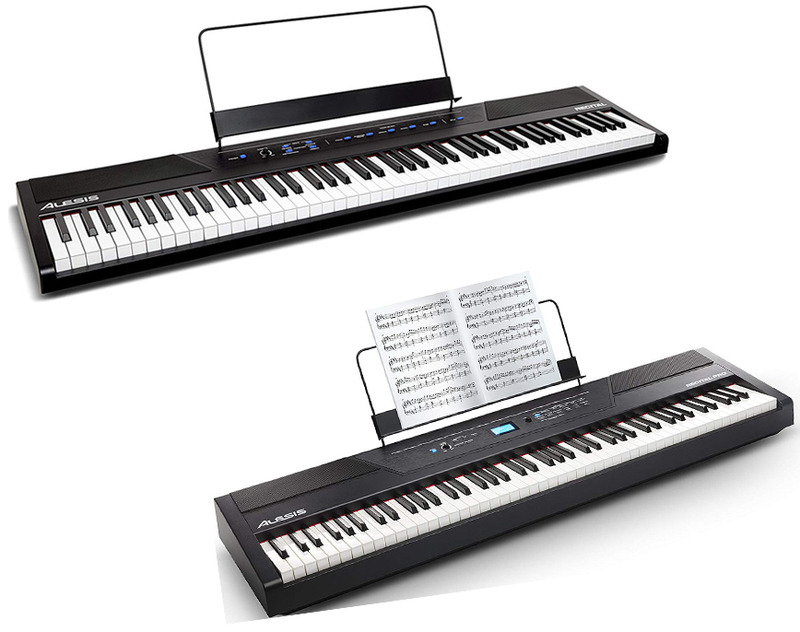 For those who play with a teacher, Alesis Recital has a function called Lesson Mode which will split the keys into two separate section to allow student and teacher play at the same time. There is ¼ headphone jack to play quietly and a USB port when you want to record in digital workstation. Another great electronic keyboard from the company is the Recital Pro which is the better model of the original version. Just like its name however, it is not designed for beginner and more for those with more experience. It still comes with many useful features from the regular piano but since it is more expensive, you may also get some better capabilities here. The piano is good for teacher or those with more experience with additional functions to facilitate better playing. You can easily differentiate the original Recital with the Pro version just by looking at them. Except the naming of the model, the control panel and overall look are also different because Pro definitely look more expensive with its small screen in the middle. The layout is also different and you can see that Pro is neater in arrangement. Comparing their body will also lead to the size, unfortunately, Pro is thicker than original Recital, so it may less convenient in term of storing. Just like Recital, Recital Pro is coming with 88-keys weighted full keyboard with adjustable sensitivity. Its feeling is still not as natural as many other more expensive model but it is still very nice. Because it is using a touch response, the sound coming from the speaker is also decided by how strong you play the keys. To put it simply, the stronger you play them, the harder the sound coming. You may choose the sensitivity from fixed velocity, soft, medium, and hard. As for the built-in voices, Recital Pro is packed with 12 voices consisting of 6 instruments but with 2 variations each; electric piano, piano, organ, synth, harpsichord, and acoustic bass. To access these instruments, you can use the control panel at the top of the piano and when activated, the button will give a blue light but when another voice is selected, the button becomes red. To see what voice you are currently in, the name is displayed at the screen for better viewing. This piano still has the 128-note polyphony from the original model. Layer mode and split mode are also present here, so you can select two different voices and make the piano layer them together or make the piano split into two parts. For the connectivity, there are ¼ inch jack for headphone and USB-MIDI to connect to your PC. Another useful feature from recital Pro is the ability to record song directly to the piano, but it can only take one song. Now, let’s compare Alesis Recital with Recital Pro. As you may already know, Recital is aimed towards beginner while the Pro model is for those with more experience. What set them apart from each other is mainly the built-in voices (5 vs 12) and the ability to record song directly into the piano which is not available in the original model. - Exclusive to Amazon - The ultimate beginners digital piano loaded with 5 expertly crafted voices (Acoustic Piano, Electric Piano, Organ, Synth, and Bass) and powerful educational features that guarantee to have you playing professional keys fast! All in all, the decision is all yours to make. In our opinion, both of them are good option for an affordable pianos. However, if you are new learner and have limited budget, we will recommend you the more affordable Alesis Recital because all the functions are already enough for beginner. techbuckarch.com is a participant in the Amazon Services LLC Associates Program, an affiliate advertising program designed to provide a means for sites to earn advertising fees by advertising and linking to techbuckarch.com (amazon.com, amazonsupply.com, or myhabit.com).